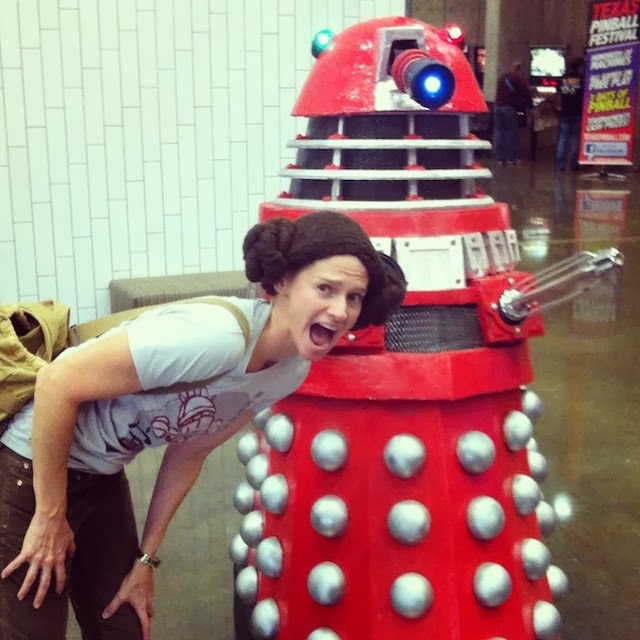 My So- Called Handmade Life: Dallas Comic Con Re-Cap- Hehe, Get it? 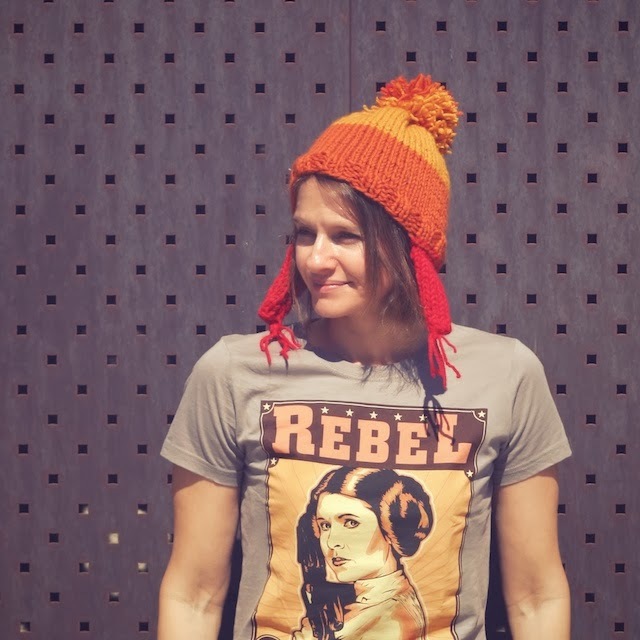 If you are not into things like sci-fi and knitting, you may want to skip this post. Wait! What were you even doing here in the first place? For info on these knitted hats, scroll to the end. This weekend we went, we wore weird hats, we met some of our favorite tv/ movie actors, and, most importantly, we relaxed. We'd all, separately, had our own hectic few weeks, so the idea of camping out in a Q and A room sounded great to me. The interviews were the main attraction for me, anyway. Carrie Fisher backed out, but I wore the hat anyway and Friday night we saw Anthony Daniels's (C3P0) who didn't let some empty seats bring the mood down. He walked the floor, meeting fans before the show and all through the weekend, and gave a really fun panel that required much audience participation. For instance, every time he held up the "VIP Jump" directional signs all the VIP wrist band wearers had to hop up and down. This was punishment for paying double to fund his appearance, I suppose. 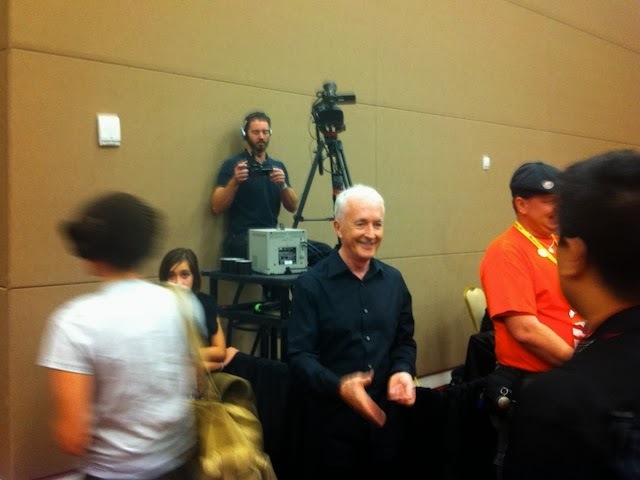 He also roamed the audience, picking people to question about their costumes. One man who dared to say he liked The Phantom Menace was made to act out R2D2 in a scene with Anthony. He had to squat to R2 height and when he didn't do a correct imitation, other audience members were called on to supply sound effects for R2, the desert wind (This was the pod landing scene on Tatooine), and the hydraulic sound of C3P0's joints. 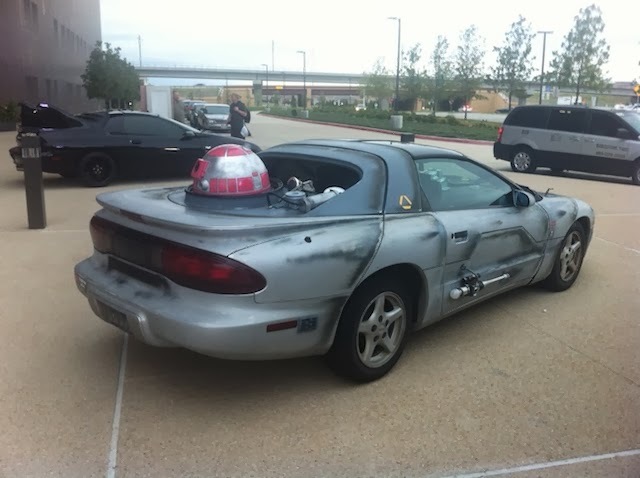 Then the scene was re-enacted up to, "You'll be malfunctioning within a day, you nearsighted scrap pile!" and a swift kick complete with sound effects. There was a bloopers reel (apparently C3P0 crashes into stuff a lot) and he shook each person's hand as they left the conference room. He started to chide me for not being in costume until he looked up and saw the wig. You can see him with the blurry star puffs here. We met him the next day in his autograph room just after he gave an autograph away to a little boy who had blown through all of his souvenir money. It was slow then, so he took his time looking through the book I brought for him to sign. It was one of those little paperbacks that accompany a 45 record and you flip the page when the bell rings. I've had this since I was 5 or 6 and read through it with great care as a child. I remember bringing it for show and tell in first grade. He read through some of it, correcting the writing, "I never said that." and "That's not how it happened." Then we heard, "We're doomed." from the man himself. Pretty cool. I wasn't super crazy about seeing John Heder or Michael Rosenbaum because, though I loved Napolean Dynamite, I haven't really seen John Heder in anything else and I've yet to watch Smallville. But their panel was also a hoot. They were running all over the room, moon walking, getting right in people's faces as they asked questions. They played so well off of one another, it was clear that they are good friends. Michael revealed that just before they arrived Friday, John actually panicked for a second in the car because he forgot his chapstick... really. And we heard, "Tina, you fat lard, come get some dinner!" from John, himself. 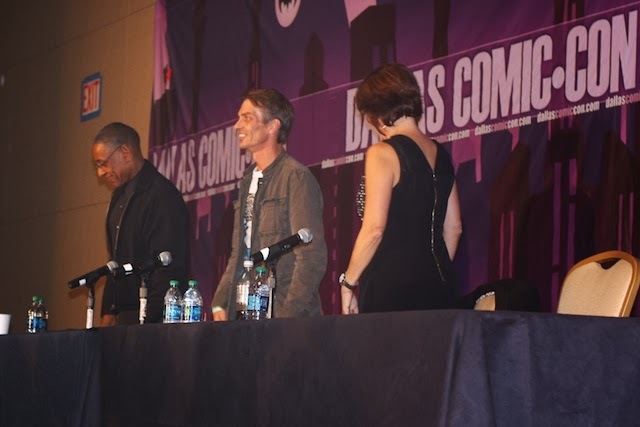 Giancarlo Esposito, Charles Baker, and Robert Patrick were equally good humored, though not as boisterous. Robert Patrick was quick to launch into stories from his first acting gigs and how frightened he was to star in a Terminator movie. He told how he unwittingly baited James Gandolfini into beating the crap out of him by telling him to bring his A game to a fight scene. He also mentioned he'd like to be in Terminator 5..hint...hint. 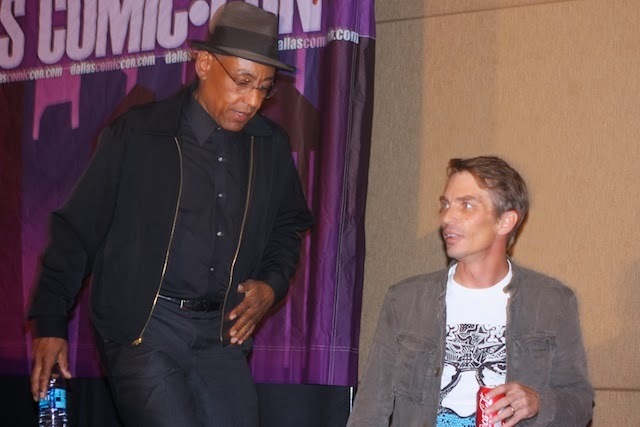 Since I haven't seen Breaking Bad yet, I have no frame of reference for Charles Baker, but I was still interested by his take on the show and Giancarlo Esposito surprised us by being... bubbly... is the only word for it. 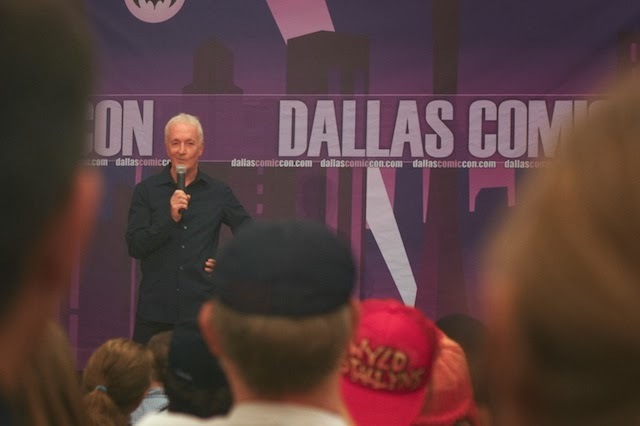 He plays such evil characters but in his panel, he was full of gratitude to the universe for letting him do what he does and full of advice on how to tap into the connective energy of all things to ask the universe for what you want. When he wasn't the embodiment of "The Secret" he was giving behind the scenes scoop on his last scene in Breaking Bad. Then we heard Gus's final yell, from Giancarlo himself. Later I saw that he posed in photos with fans, holding a box cutter - funny. The comic book artists' panel was the only one were gratitude and good will was lacking, so I won't go into it much. Besides, I think Neal Adams promoted Neal Adams enough in the panel with Herb Trimpe as his chuckling, Ed McMahon-esque side kick. I will say that being hostile, acting bored, and even saying you're bored by fans' questions ought to keep an artist from being invited back, but he has a following so I doubt that will happen. He did make it abundantly clear that he is a savvy business man and his art is all about money. I haven't heard a diva so intent on tooting their own horn since girls in Junior High. I rarely ever read comics, so I would've left but I was blocked in and, unlike the artists, I didn't want to be rude. Besides, I can always save my gripes for my little-known blog. Oh, we also heard, "Nothin' but the rain," from Katee, herself. Of course we had our photo taken with them and I had another regret: Jamie said, "I want a woolly hat too, " just being polite, and I didn't have the mental snap to hand him mine because I was instantly pushed away from the backdrop by the photo people. I know, what would he do with a "Woolly hat" that he doesn't recognize as a Jayne hat because he doesn't even watch his own show, much less Firefly? But still, I could've said Jamie and I shared a hat. So... much... regret... sob. Later, when I picked up the photo from the Battlestar Photo-op table, I saw a major discrepancy between their photo-op style and John Barrowman's. Don't get me wrong, I'm thrilled by my photo-op with Jamie and Katee, but I did understand why we were told tickets to his photo-op sell out fast. He was all over his fans! They rode piggy back, bum slapped him, gave full frontal embraces, danced together. He's a ham and they love it. His Q and A was Sunday but I think it drew the biggest crowd. He was amped up like Heder and Rosenbaum, and moved constantly, re-enacting his and David Tennant's reaction to reading the script in which Captain Jack is revealed as The Face of Boe. He told how David kept banging on his trailer door, asking if he'd read it just to be shooed away so he wouldn't spoil anything. Finally, John read it and went banging on David's door. They had a breathless, animated charades-ike session of acting out how John could become the giant suspended head. There was also singing- lots of singing because he has an excellent voice. He also re-enacted a classic theatrical moment where during his performance in Anything Goes, his co-star, Martin, blasted gas in the dramatic pause before the last note of a song. He actually laid across the panel table and rolled to one side to demonstrate. Oh boy, crazy. It was the telling of racy, behind-the-scenes gags that made me glad I hadn't brought my kids with me. 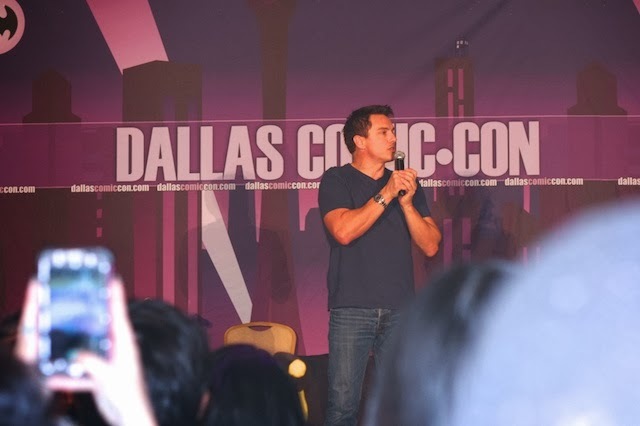 I can say this about John Barrowman, he was all about giving his fans, and there were so many, their money's worth. He didn't stop, from the "personalized" photo-ops to inviting fans who couldn't get a seat to take empty VIP seats up front, to a singing/dancing performance. 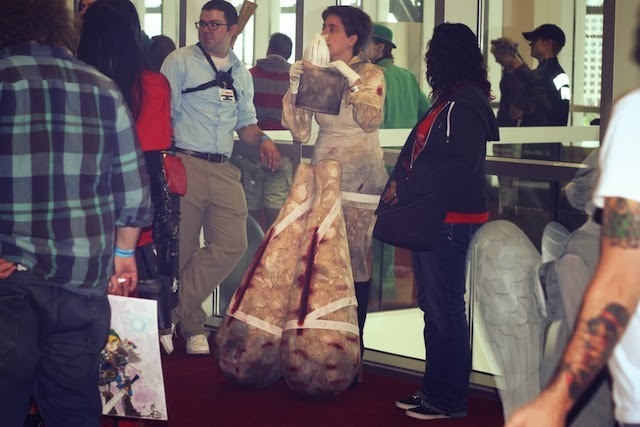 I was too busy doing my own thing to get many photos of cosplay there. Somehow with a giant Alien and Predator fighting on the landing, tons of Viper and X-Wing pilots, a hairy Wonder Woman, and a big group of kids dressed like all of the main characters from The Girl in the Fireplace episode of Dr. Who, all I came home with were these blurry phone pics. But I had used all of my memory to record some Q&As. Just check out instagram for an idea of what it was like. Look Mermaid Man has on slippers. 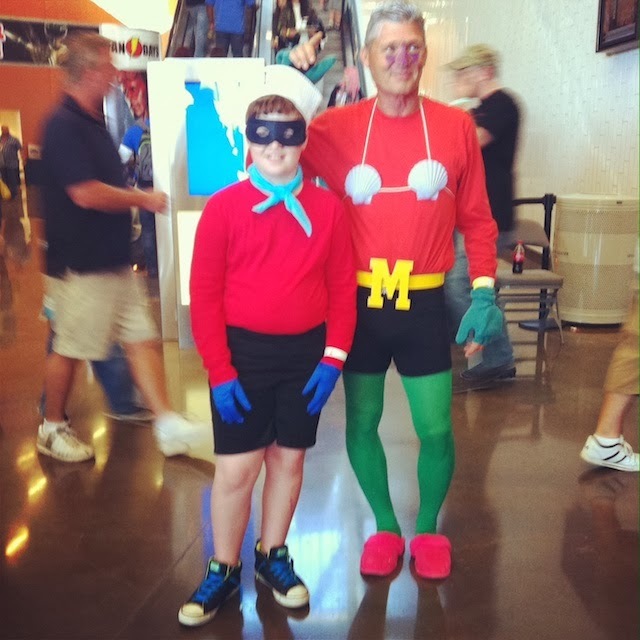 That was my take on Dallas Comic Con. Now for the most fascinating part: the knitted fan hats! 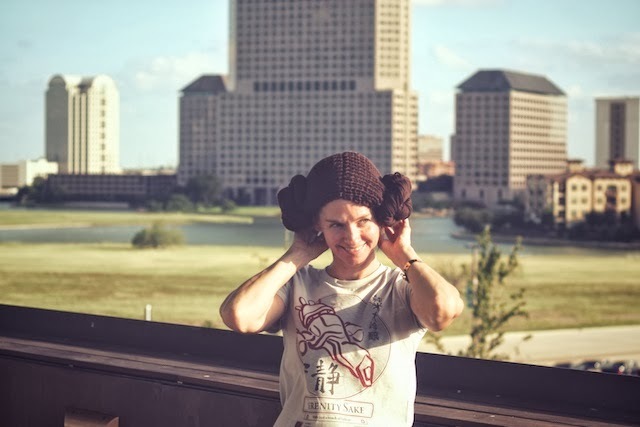 I spent the whole ride up to Dallas sitting in the back seat, knitting the Leia hair pattern by Jennifer Carter. My only modification was to only knit 52 cast-on stitches. Because my stitch count was off, I decreased one extra stitch at the end of that first dec row and sometimes had to change the order of knits and purls. I decreased as many times as called for, though ending with a slightly different stitch count. Using yarn to tighten the wig to fit like a beanie was tricky. I didn't knot anything off until I was completely finished with the wig. I really didn't know if it would fit until I had finished it and could try. Thankfully, it did. I then used my second skein of Wool of the Andes Bulky for the "star puffs." It is the correct yardage for two buns, so I had to divide it. I used my husband's headrest to lay the skein over and count the loops hanging over it. I then wound half of the loops into a spare yarn ball and cut the yarn. Positioning the buns was also a trial and error sort of thing. 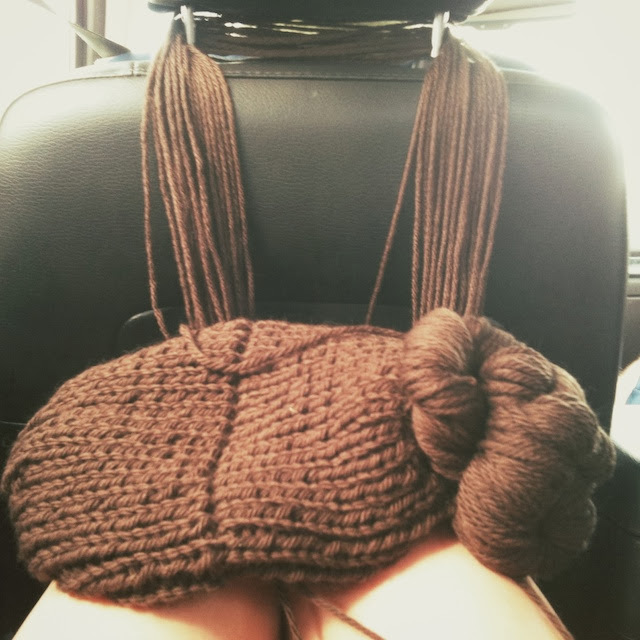 When I liked its position, I unwound the spare ball of yarn over the headrest to the approximate size of the first bun's worth, and shaped it into the other bun. The fit was alright and had a bit of room in back for me to tuck my hair out of sight. There was no doubt who this was supposed to be. 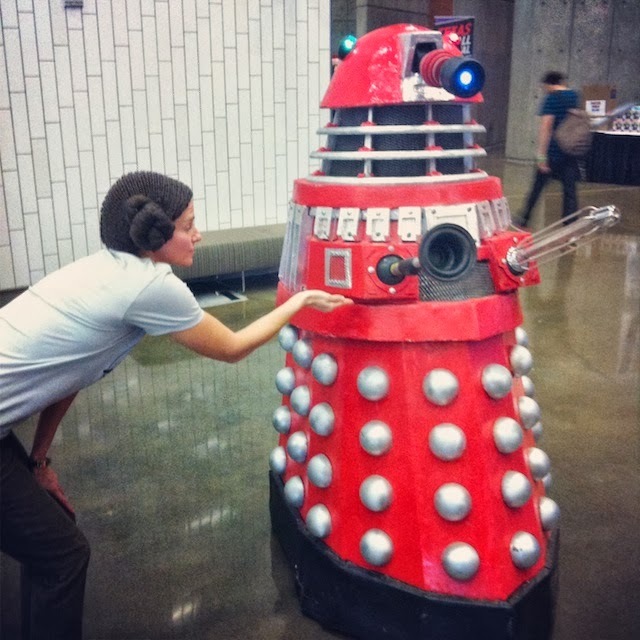 Daleks even like it. 3) They are meant to be knit a bit sloppily, so no great focus is required. It was almost hard to make myself decrease so abruptly and make such a messy pompom. The ear flaps were ratty, but I think the pattern I used, by Erika Barcott, was most true to the one Adam Baldwin wears in Firefly and the ears flaps did, indeed, flip outward in a goofy way. I used yellow Wool Ease and red and pumpkin colored Lion Wool for this with size 10 needles. Mine was a size medium and Adam's (my Adam) was a large. Amid all of this, we rounded out the weekend with an Imax showing of Gravity. I had fun, guys. Though you don't see my brother here, because he's not into photos, it meant so much to me to get to hang out with him, especially doing the nerdy stuff we like to do. I mean, we met our first-ever action figure (C3P0)! I reveled in the conversation and odd situations. I haven't laughed so much or so loudly in ages. 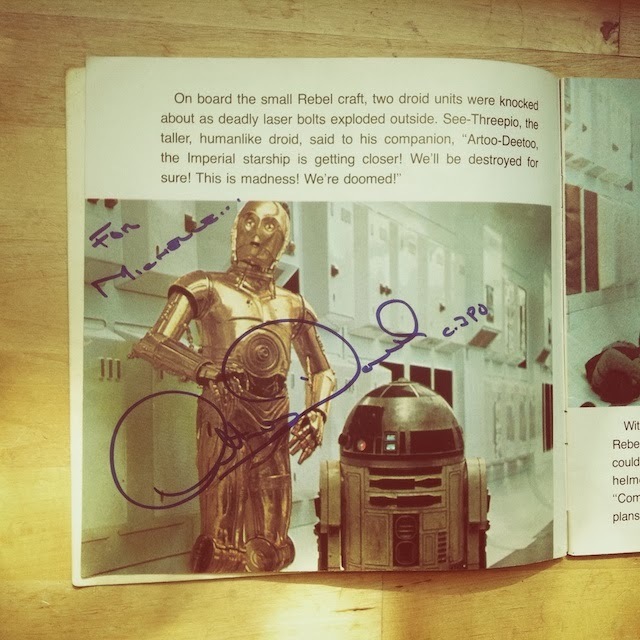 Here I inserted chewing gum into the memory banks of this R2 unit. More on my flickr, ravelry, kollabora, instagram, yada, yada, yada. 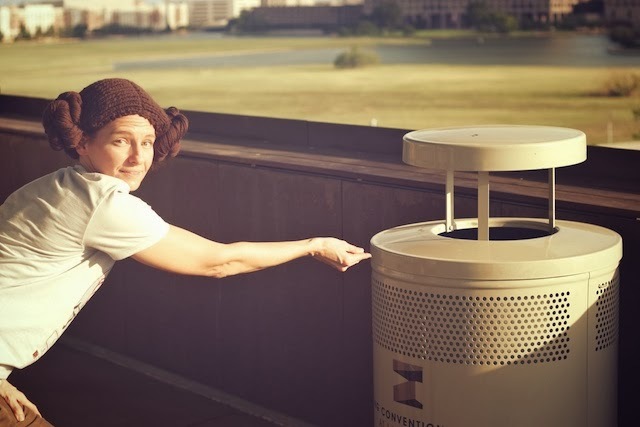 more on the Leia and Jayne hats here. Awesome recap! 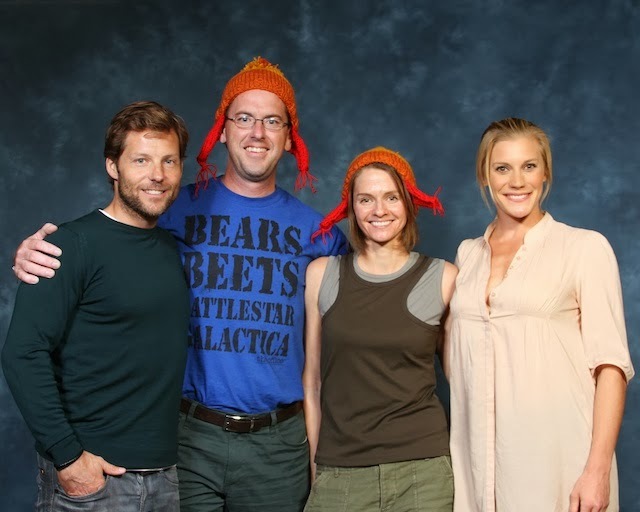 So cool that you got to meet and hear some wonderful sci-fi personalities (especially Jamie Bamber!) 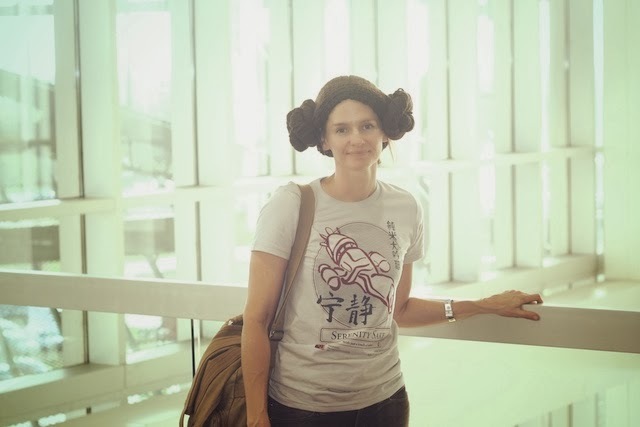 Love the leia hair and Jayne hat. I agree that the outward flip of the earflaps is an essential requirement for a Jayne hat. oh my god!!! that looks like such a blast!!! and you met famous people!!!! awesome. That looks like such a blast! The hats are perfect. 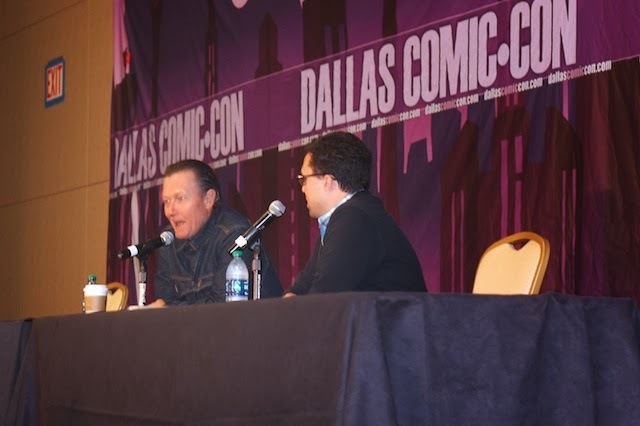 :) And you got to see Robert Patrick?! Did he talk about The X-Files? I'm a HUGE X-Files nerd. 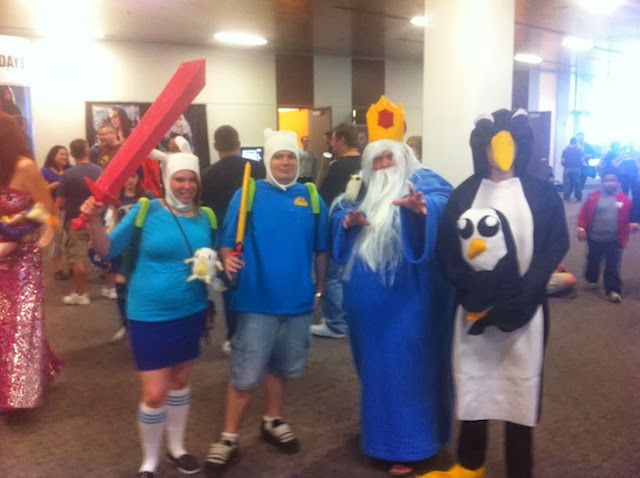 One who has never seen the final episode...but I know every episode in seasons 1-8. :D I would love to do something like this with my brother, but we are not so into crowds. I had so much fun reading this, Michelle. I wish I could have been there. 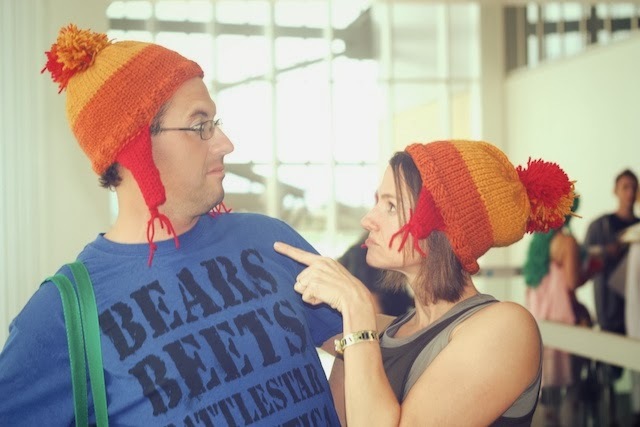 That Jayne hat is great, I should make a couple for the convention we're attending at the beginning of December. Ha, thanks, Libby. Oh, yes, me too. I never got to dress up as cool things for Halloween. One year I convinced my mom to let me wear my brother's old Superman costume. I was a baggy legged Supergirl and I loved it! Thank you, Tien. It was a very fun weekend. I just checked out your blog and Ravelry. Oh my, your Hekla is killing me. I love it. I also just got Respect the Spindle and hope to begin learning before too long. I did! And it was awesome! I so wanted to go to the one that happened in Dallas a few months before. It had Carrie Fisher and William Shatner, Adam Baldwin, and maybe Summer Glau. But my daughter was graduating and it was too much to do both in one month. I'm thinking maybe smaller conventions are better for talking with the actors. He only said that he would like to be in the next XFiles movie, if there is one. This makes me think there will be. I want to go back and re-watch all the old episodes, now. I used to go to my brother's apartment every Fri night to watch XFiles with him when I was 19 and 20, so it was cool to see Patrick there. I thought about you as I made the hats, Elena! You'd have had so much fun. You have to tell us all about your con, when you go! I'm wondering if they're the same as in the states, or what. 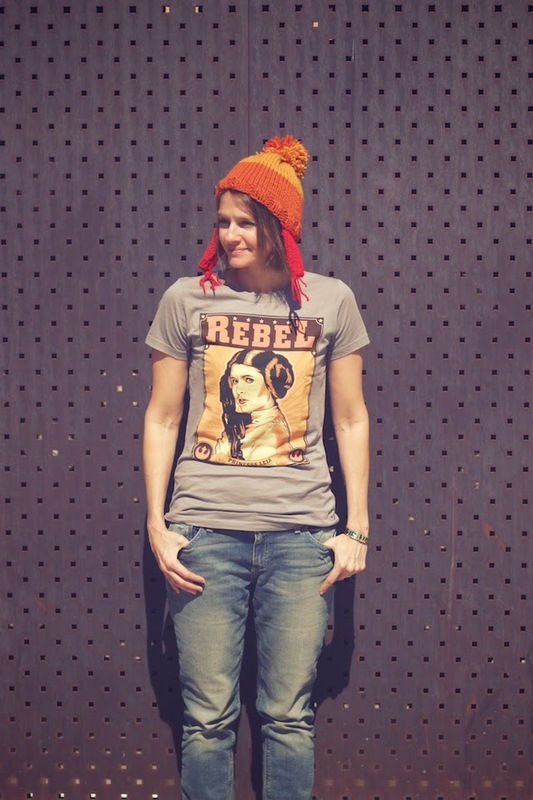 You can totally whip up a couple of these hats in 2days. Get this- John Barrowman is trying to get the okay to come on Friday nights at conventions to put on a musical performance- really! That's pretty cool because Fridays are slower at these. He also is the kind of actor that gets there early and stays until everyone gets their photo/ autograph. Whereas, some celebrities leave early and all the people who planned to see them on Sunday are out of luck. Oh great! But what if ...maybe... somehow.... you guys got David Tennant as a guest? How cool would that be?! That would be super cool indeed, so cool as to dream about it for days afterwards, but I'm afraid it's not going to happen. Oh, it would be soooo cool :D Michelle, you are brilliant!!!! I know I already commented on most of your Insta pictures - but I'm so jealous! It looks like you guys had a GREAT time and got to meet so many of my favorite scifi actors! So fun! It was much fun, Katie! 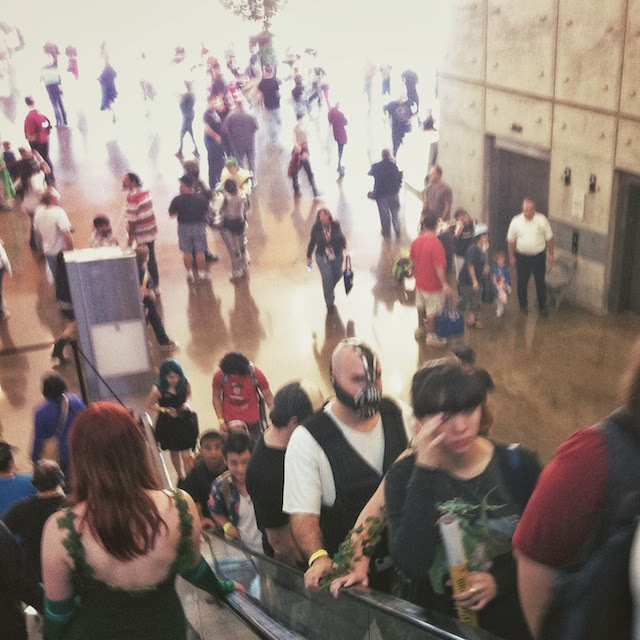 You live in California, so one day you have to go to the "real" Comic Con. 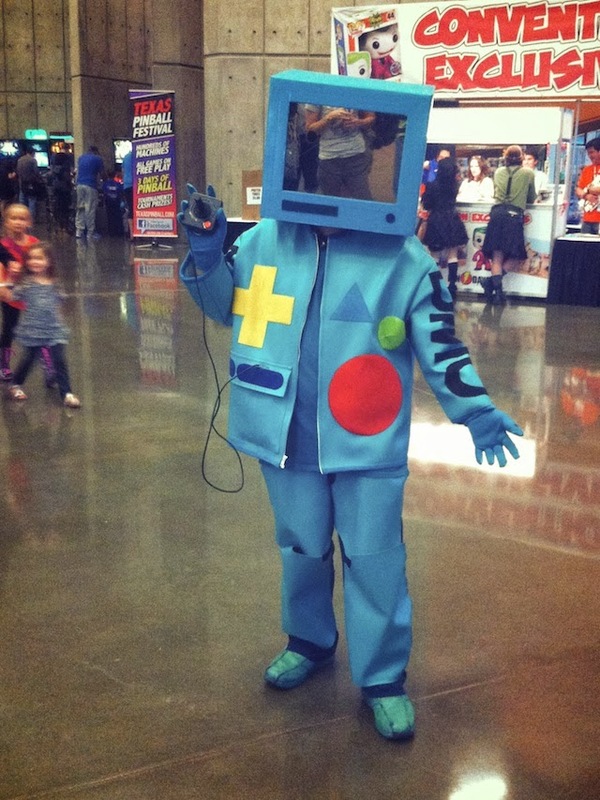 You would make the best costume, no doubt, and then I will be insanely jealous!